Have a wine-drinking friend who isn’t yet addicted to kayaking? 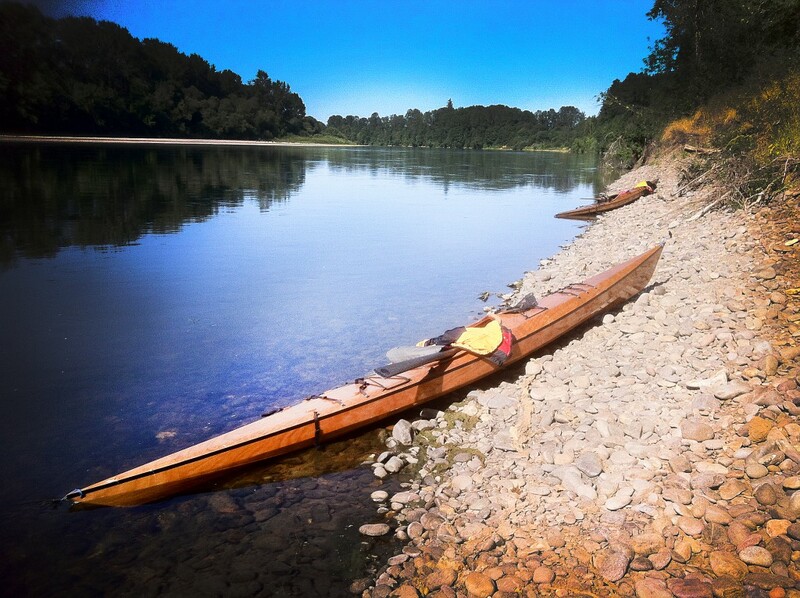 Here’s the best way to get their paddling attention: 35 miles down the Willamette through Oregon’s Wine Country. 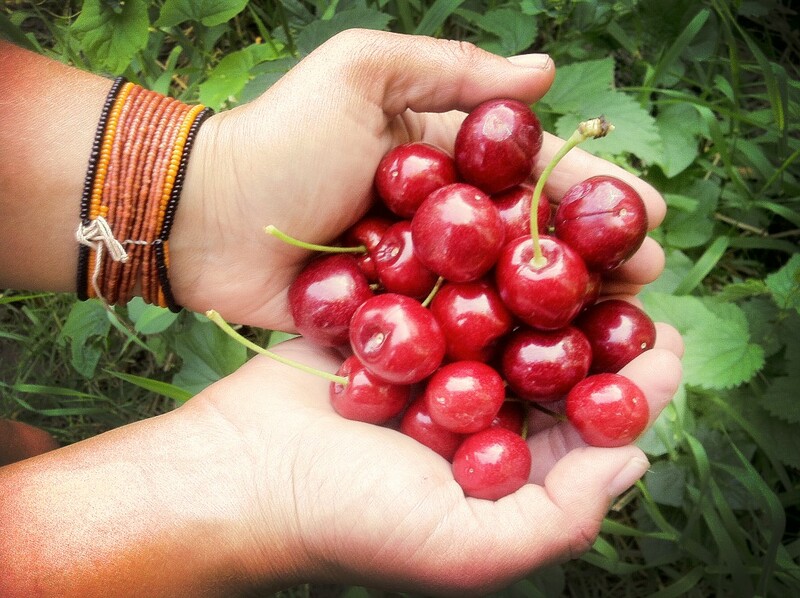 Paddle past cherry and filbert orchards, mint fields, hops and grapes. 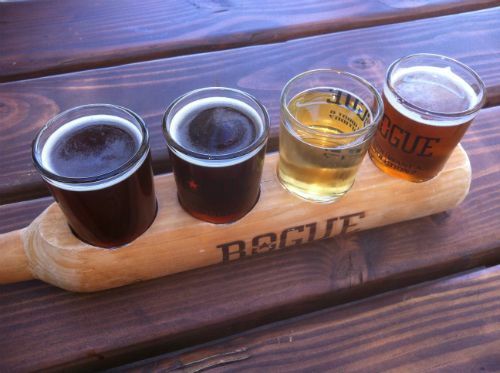 Trip Outline: Start in Buena Vista, Oregon and end at Arcane Cellars (just past the Wheatland Ferry) with a stop along the way at Rogue Farms Tasting Room (ok, this isn’t wine, but it’s very tasty beer). This section of the river is very mellow with only a few riffles, the largest of which is right at the beginning just after the put-in in Buena Vista. The current is not strong so paddling is necessary to cover some miles but it is assisted with a light current. We took our trip in late June on a very hot and dry year so the river was quite low but still easily navigable in our 17′ Murrelets. A great resource for our trip was the Willamette Water Trail website, which allows you to check for launch sites, campsites, and potable water along the way. The biggest hazards we encountered were heat and sunburn with temperatures into the 90s, but the river provided the perfect place to cool off. Nonetheless, paddlers should have practiced and feel comfortable with wet exits and self rescues. Overall it is a very forgiving environment. Perhaps the least intuitive part in the planning process is accepting that the river runs from south to north. Don’t quite feel confident putting together your own trip? Consider signing up for Paddle Oregon, an outfitted trip that does a similar route with spectacularly catered breakfasts, lunches and dinners. Proceeds from this trip go to a good cause, Willamette Riverkeeper, which is a non-profit organization that works to protect and restore the Willamette River’s water quality and habitat. Our Murrelets at American Bottom. One local said this is the lowest she’s ever seen the river. At higher flows the campsite is closer to water level. Day 1: Put-in at Buena Vista. Day 1 is almost always more of a logistics day: get groceries, run the shuttle, pack the boats and check off all those to-do lists. Buena Vista is a tiny town without a store so all groceries, ice, etc., should be purchased in advance. Also, the park/boat ramp does have pit toilets but no running water so all dromedaries/water containers should be filled beforehand. In regards to overnight parking, I contacted the park in advance (503-623-8172) to let them know my car would be there for a few days. There was no charge but they do like to be notified so they can let the sheriff know. 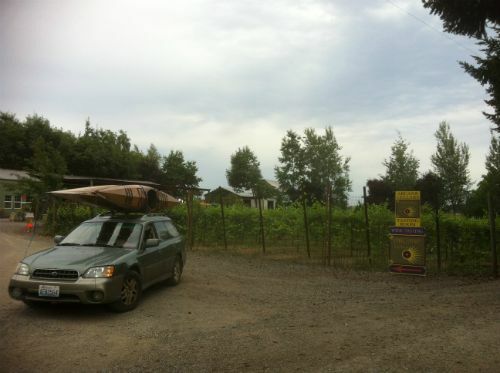 On the other end, the folks at Arcane Cellars are wonderfully supportive of paddlers. 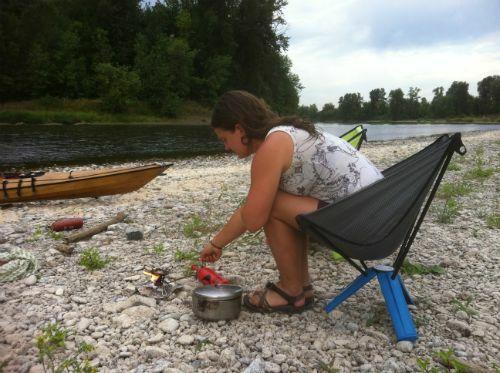 They offer free camping and showers to anyone who arrives by kayak/canoe. In addition to this amazing hospitality their wine is fantastic and they even allow paddlers to leave a car at their vineyard with prior approval. Just be sure and notify them you are coming to make sure they don’t have any special events planned at that time that would limit parking: call 503-868-7076 or 503-932-2396. After running shuttle a great goal for the first night on the river is only 2.5 miles down at American Bottom on river left. It has picnic tables, a seasonal toilet, grassy areas for tents and nice morning shade, but no running water. At low water it was difficult to see the site and we almost missed the sign so keep left and keep an eye out. If logistics really run late then there is always Wells Island which is directly after the boat ramp (.2 miles) which has no amenities but does offer a flat gravel bar for camping on if light is running out. There are many islands like this along the way and all of them are open to camping, though some can be noisy if irrigation generators are nearby. 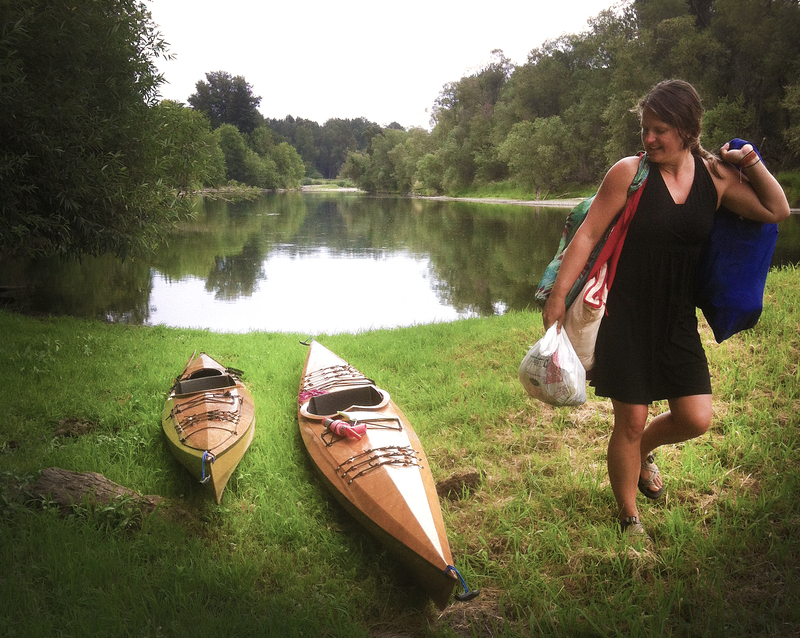 Day 2: Paddling & Rogue Farms. This section of the river we saw very few people and loads of birds: Osprey, Bald Eagles and falcons, to name a few. Rogue Farms doesn’t open till 11 and its only 1.5 miles down river from American Bottom so a leisurely morning can be spent at camp. Or, day 1 could even choose to include this stop and camp downriver from Rogue (just use the Willamette Water Trail website to find a campground on the other side of Rogue- there is an island just past the farms called Judson Rocks). 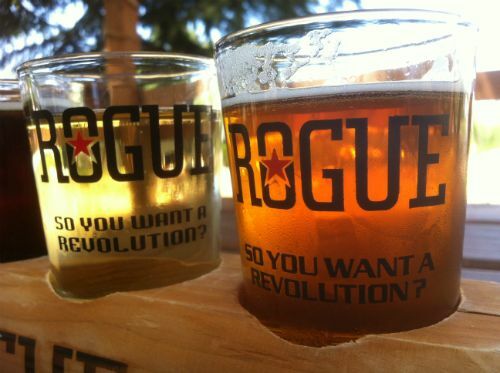 Rogue’s tasting room hours are 11:00am-9:00pm, Sunday through Thursday and 11:00am-10:00pm Friday and Saturday. 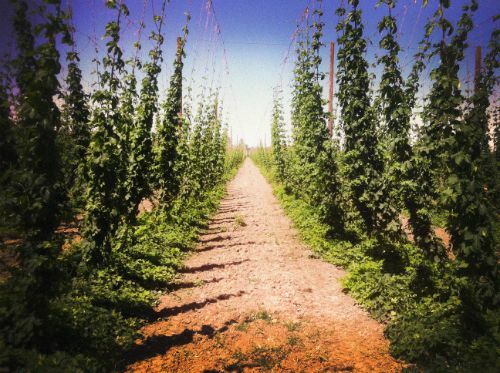 Rogue Farms is truly a large farm where they grow their own hops, barley, filberts (hazelnuts), berries, peppers, honey and other tasty things that they creatively weave into their many different flavors of beers. There is a food cart with lunch fare and a nice grassy lawn with games. When we were there families had brought their kids who were loving all the free space they had to run, throw frisbees, and generally just be kids. We had lunch, sampled some tasty beer, filled our dwindling water supply (did I mention it was HOT?) and continued on our way with some beer in tow for camping that evening. We paddled approximately 14.5 miles this day, which felt quite leisurely even after a two hour stop over and swim at Rogue. We opted to camp on one of the river islands just south of Salem, though it was a bit noisy due to an irrigation pump that ran all night. Day 3: We paddled most of the day with some nice stops for swimming along the way, including lunch at Keizer Rapids and a bathroom break in Salem (there are public restrooms/port-o-pots at Riverfront City Park). It’s an 18 mile stretch from where we camped just south of Salem to Arcane Cellars. This stretch could be broken up by making it further on day two or by chopping this section into two-days and perhaps camping at Keizer Rapids (from Keizer to Arcane it is approximately 8.5 miles). The tasting room at Arcane closes at 4pm so we hit the river early to ensure we got there in time for a tasting. Even with 18 miles to cover we were able to make it to the tasting room by 3pm. Along the way we were surprised at how undeveloped the riverfront of Salem seemed. The overgrown banks conceal the city well. We were warned of lots of homeless people along the river’s edge but we didn’t see anyone that looked too menacing and we paddled straight through without much indication that there was a bustling city around us, aside from the overpasses and a little more traffic on the water (including some motor boats). We were therefore quite surprised when we arrived at the Wheatland ferry crossing to a storm of boat traffic, jet skis and lots of families bar-b-quing along the banks. It was a Saturday and it seemed that all of Salem had come here to spend the hot day playing within a half mile section of the river. It was by far the most amount of traffic we encountered the entire trip. We carefully picked our way along shore, avoiding skipped rocks, jet-skis and the small ferry, then we happily tucked to the left just after the ferry crossing. Here the river splits and motor boats are not allowed to follow the left section of the river as it narrows and quietly wraps through farmland. 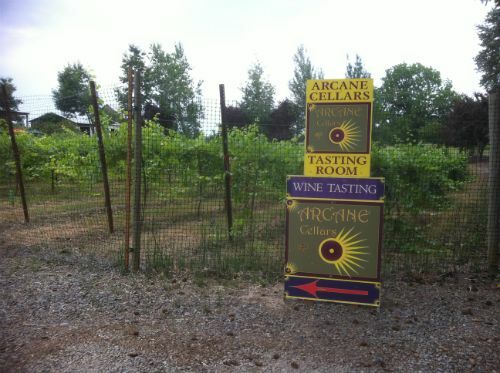 Arcane Cellars is about .5-.75 miles from the ferry crossing and was a welcome reprieve from the loud scene just upriver. Kayak campers are treated well with a lovely campsite under a beautiful old walnut tree with access to bathrooms and a shower. After tasting the amazing wines we settled on a bottle for the evening (and a few to take with us) and nestled down under the walnut tree next to the vineyard. The perfect ending to a laid back river trip. 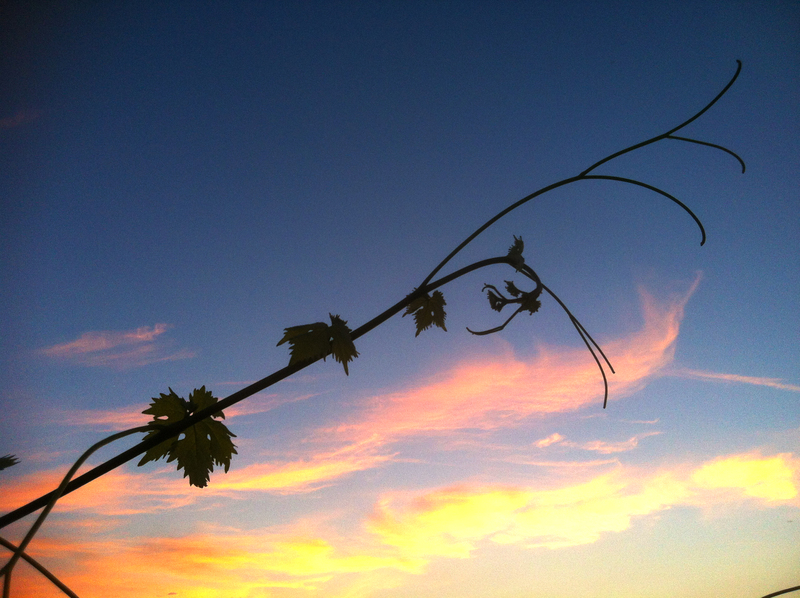 Sunset at Arcane Cellars Vineyard. 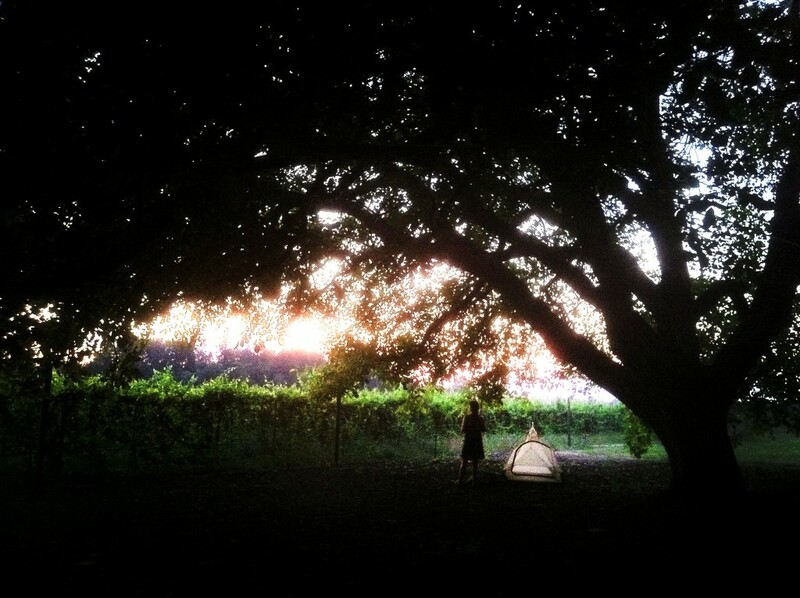 The amazing campsite at Arcane Cellars under a giant Walnut tree next to the vineyard. 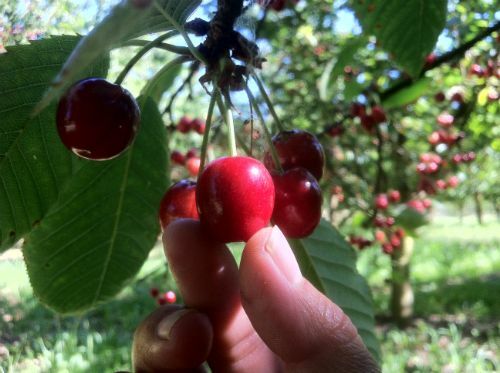 Day 2: A local invited us to pick cherries from a nearby orchard. Lucky us!!! The takeout at Arcane Cellars is a nice grassy knoll located next to a quiet bend in the river. By Laura Prendergast who has the privilege of working at Pygmy Boats and playing in them.